At his meeting with the Estonian Lutheran archbishop yesterday in Tallinn, Kirill I acknowledged Andres Põder for his opposition to a Russian punk band’s musical “desecration” of an Orthodox Church. 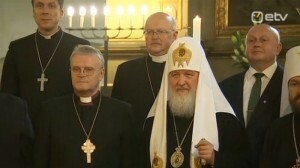 Kirill I, who leads the Moscow Patriarchate of the Orthodox Church, thanked Põder for his “very clear position in connection with the manifestation of hooliganism in the sanctuary of the Cathedral of Church the Savior,” referring to [delteted]’s February 21, 2012 performance, which resulted in two-year prison sentences for several members of the feminist band. “It was very important to hear your voice, which did not stem from Realpolitik but your Christian convictions,” Interfax quoted Kirill as telling Põder. Lutheran Archbishop Andres Põder said in a letter last April in which he expressed astonishment that members of parliament had condoned “hooliganism” against the Orthodox Church in Moscow. Põder also criticised Estonian President Toomas Hendrik Ilves for attending a concert in support of [deleted].